Dr. Aubrey Tauer, co-founder of Cura Earth, on the connection between human and animal diseases, global veterinary medicine, and building capacity in countries around the world. In 2011, you and Dr. Melissa Raguet-Schofield co-founded Cura Earth – what inspired you to start the organization? Well, we had both spent time in Nicaragua. Melissa had done her PHD research there and we both fell in love with the country. There wasn’t an organization and isn’t still, aside from Cura Earth, an organization that was focusing on the One Health movement. We felt in general that Nicaragua is neglected by the larger international NGOS – Central America in general and Nicaragua in particular. We’ve also worked in El Salvador and are going to start some projects in other areas as well. It was a part of the world that could really use health concepts, so we just decided to start the organization to build capacity in these countries, and be able to do research that would contribute to a better understanding of how health works in the context of the environment and different populations – for example, humans, domestic animals, and wild animals. We felt we could potentially make a real difference. Why do you think Nicaragua has been neglected by other NGOs? I don’t know if some of it is political, lasting from when the US had issues with Nicaragua in the past. It is the second poorest country in the western hemisphere, right behind Haiti, and is a country that needs significant investment. There are a lot of smaller, homegrown NGOS, and there are some international NGOs, but a lot of them have really small programs. It’s a country that gets forgotten a lot. It’s an important country, not just because of the poverty, but because it also has the largest continuous rainforest in western hemisphere, second to the Amazon. Nicaragua has an incredible amount of biodiversity that needs conserving, and is a really important country in that aspect. Nicaragua has been growing as an ecotourism destination and a lot of the hotel and restaurant owners have a very conservation-minded ethic. The government itself is trying to build ecotourism into a lot of things. It’s one of the only countries in the word that has used its army as a conservation body. They had their army go out and do patrolling for areas, for deforestation. They’ve had them do reforestation work. They’ve actually used them to help with the conservation of their country. It’s an interesting political thing. Not many countries, if any, do that. Cura Earth is focused on the connection between public health and wildlife health – can you explain this correlation? We’ve found over the past few years that about 70 percent of new and reemerging infectious diseases have an animal origin. We have found that these diseases are spilling over into humans, and we think a lot of that has to do with humans encroaching more and more into animal spaces. So, certain human activities including deforestation, bush meat hunting, and burning land for agriculture, puts you more in contact with animals and allows these diseases to spread into the human population. We’ve been having a crisis over the last 40 to 50 years of new diseases popping up, and old ones too. Tuberculosis, like bovine tuberculosis, is appearing in human populations again. We know this is a problem and have a pretty good idea of why this is happening, but what’s missing is doing anything about stopping it. Wildlife are good indicators too – they’re good indicators of the overall health of the environment. Monitoring wildlife and monitoring them for disease, you get a good idea of how healthy the overall ecosystem is, which impacts humans, of course. That’s one of the reasons why we work with sea turtles. They’re the poster child – they’re a great project – because they do impact all 3 areas. So, they’re environmental indicators because they’re very sensitive to what’s going on in the ocean, and with overfishing and pollution and changes to the temperature of the water. They are still consumed by thousands of people each year, so the eggs and adult meat is eaten. There are diseases that can be passed from the eggs and the meat to humans. And then there are conservation concerns – they are highly endangered, a keystone species in the environment. Hawksbills in particular are really important, and it’s the main species we’re working with now, but we’re looking to expand to other species this year. Hawksbills eat a lot of sponges which have a big impact on coral reefs. If you have too many sponges, they start destroying coral reefs. You need the hawksbill there to keep the sponge population in control. They’re a great project because they touch on all these subjects which Cura Earth is about, which is why we’ve picked them as one of our flagship projects. 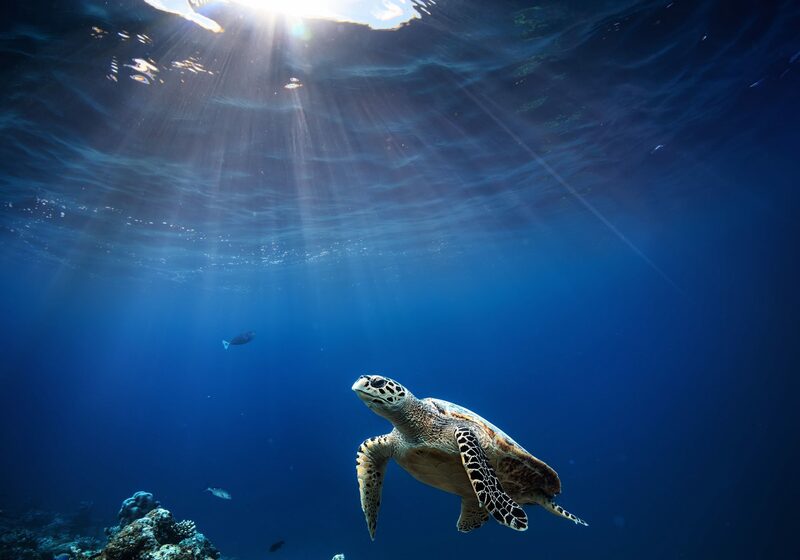 How has the focus of CE’s work changed, and how does it continue to evolve since its founding, especially given your new initiative to study the microbiome of sea turtles? The focus had been pretty much the same. We have new ideas for projects that come up. We’re looking for funding in jaguar health. We’re looking at multiple countries. That was kind of serendipitous because I met somebody at a conference who was doing work with jaguars and was interested in microbiome research. They were really interested in combining that with other jaguar health studies. Some of the things were serendipitous and just happened. How we get to where we end up has changed a little. I was a little naive when I started the organization, and I thought it would be easier to raise a lot of money in a short amount of time and get started on a variety of projects. My hope for the organization has been that we would be able to start providing some veterinarian services in remote areas of the country where there aren’t any veterinarians. And also, in concert with that, do some public health work in those communities. We’re still waiting to get enough funding to be able to do that. The only thing that’s changed is just the timeline. We still want to do a lot of the same projects and work, it’s just that the timeline has changed a little bit. Can you describe what is meant by the term microbiome? The microbiome is the community of microbes that are in or on an organism, and not just an organism. There’s a microbiome of different habitat types – so basically, any organism or any substrate because there’s a microbiome for your home too. There’s a community of microbes, so that includes bacteria, fungi, and viruses. That’s present pretty much anywhere. An exception appears to be caterpillars, as they were recently discovered to not have microbiomes. We know a lot about the microbiome in humans and we’ve found that’s very important to a lot of physiological functions in the body. Particularly with gut health – the microbes in the gut will create different molecules – different things that the body uses almost as the same as hormones that the body produces or neurotransmitters. We’ve found that in humans and other animals – lab animals, mostly. They’re starting to do this more and more with wildlife, as well as with cats and dogs. We’ve found it impacts gut health, immunology in the body, immunity, reproduction, and a lot of stuff they’re coming out with looks at how it impacts mental health and neurological function as well. My concern is that we know from other organisms that the microbiome can be influenced by the environment. We know this with sea turtles, but there’s been very little research done on this. When we started the Indiegogo campaign for this project, actually nothing had been published on sea turtle microbiomes; since then, one paper has been published, but it’s still a new area that hasn’t had much research done on it at all. Sea turtles are very exquisitely responsive to their environment. They’re in an environment where they spend 99.9 percent of time in the ocean. Only the females really come out onto the land when they’re nesting. They come out, nest, and go back into the oceans in a very brief amount of time. We know that oceans are changing rapidly. The temperature is changing. Acidity is changing. There’s a lot of pollution. Sea turtle diets appear to be changing because of a whole cascade of changes in their ecosystem, and we know that they’re also ingesting a lot of plastic. Usually, when I’m in Nicaragua or El Salvador, there’s almost always a sea turtle that washes up on shore, dead, that I do necropsy on, and I’ve found that they’ve basically choked to death because their GI tract is packed with plastic, and they can’t eat anymore. We also know that they’re ingesting plastic in smaller amounts, that could potentially be an impact on their health. One question is how are these environmental changes to the water that they’re in going to impact the microbes in their system – on their skin and in their GI tract. Eventually, we may be able to monitor microbes in other parts of their body. The two big ones we’re starting with are the skin, GI tract, and microbiome. We want to get a nice baseline. It would be amazing if I had a time machine and could go back 70 years, and start this sampling then, and really have a good idea of what it would look like if everything was normal. We’re trying to use rehab or captive sea turtles to have a control group for the ideal situation. They’re in a well controlled aquarium system – that might be the closest to what we could get to a healthy ocean system. My plan is for this to be a long term study. My idea would be for us to have at least 10 years of data or more, and see if there are changes over time to their microbiome systems. It will provide us with a lot of information about sea turtle health in general, but it will help us understand more broadly, with animals in general – how do they adapt their microbiome to their environmental conditions. Is this something we need to be more concerned about, or be investigating more often with wildlife populations, especially endangered wildlife populations. Right now, with a lot of wildlife populations, they may do some health monitoring, and they’ll look at specific diseases or do necropsies on animals that are found dead, but they’re looking specifically at diseases and injuries, and not necessarily looking at the microbiome which is the whole health for their body. That may provide the info we need to do more of that monitoring in wildlife to see how it changes and if that impacts their physiology. What we’re doing to the ocean is going to impact the microbiome, which will impact their physiology, and that could lead to negative consequences to their health, and might impact their ability to fight off infections. The microbiome in humans can get out of sync, and some of the microbes that are normally good flora can take over and become bad flora, so I think there are a lot of questions to ask about what’s happening in the system and how this will impact the overall ability to reproduce and fight off infections and have a long life span. I’m really excited about the study and we’re finally collecting samples this summer and working with one of the universities in Nicaragua with their aquaculture programs. We have two students going up there to Estero Padre Ramos, which is an estuary system in the northwest corner of Nicaragua, and they’ll be taking samples. Right now, these samples are largely from hatchlings because that’s starting to slow down with the adults nesting. That’s a really interesting study because we don’t have any published studies looking at hatchling microbiomes, and it will be interesting to find out if it varies by nest and within nests, and what it’s kind of born with and compare that in the future with adults and juvenile samples. If I could do everything, I’d study fish and coral reefs, and that’s maybe for the future. There are people who are working on microbiome and coral reefs, and that’s not within Nicaragua – but in other parts of the world, they’re looking at seaweed and seagrass systems. They’re looking at the microbiomes there, and how they’re adapting to climate change. I don’t know of a lot of work being done on microbiomes in fish. People are eating them, so I think it would be really important to look at. Much of your work focuses on sea turtles in specific areas – Nicaragua, El Salvador, and Mexico – why was that species and those geographic areas chosen? A lot of it has to do with starting out as a nonprofit – it’s who you can work with and who’s willing to work with you – who is already in the country, and has an established presence. That’s part of it. We had a connection with somebody who ran El Salvador ICAPO – it’s an international organization. ICAPO works with Fawn and Flora International on sea turtle research in Nicaragua and in multiple countries. I’ve met the country director for El Capo in El Salvador. He was really easy to work with, and he had already wanted to do a health study on sea turtles, so that worked out really well, and we were able to do a lot of capacity building with that. We worked with a professor at one of the vet schools in El Salvador and a large group of students, so I trained the students on how to draw blood from sea turtles, process the blood, do health studies and physical exams, and take biopsies from them and what not. We were able to do some good capacity building with that. Since then, they’ve hired a vet and done rehabilitation, and that’s led to good progress for that organization. I have a colleague that I’ve known for many years who does sea turtle work in Mexico. He was just very excited about the project. Some of it just works out like the potential jaguar project – a lot of it maybe isn’t as strategic as it should be, but it comes out of people you can work with well, and who already have an established presence in the country. When you’re starting a nonprofit and you’re going into a country where you don’t have a connection, things can be difficult – you don’t know where to find or buy things, or where to get permits – so it’s important to make good connections with NGOs and with researchers who are already active. We think that’s important too. A large part of our mission is capacity building and being able to provide resources, teaching people, and providing funding. The idea is that eventually we will put ourselves out of a job, that we will have equipped the countries to do One Health research on their own, and they won’t need us anymore. That’s why we’ve ended up in the countries we have, and we’re hoping with the jaguar project to work with people in most of the countries in Central America. Basically, anywhere somebody is doing radio-collaring or capturing of jaguars – we’re hoping to work with them to get samples to do the microbiome study. Cura Earth’s work relies on a team of internal staff and advisors, and partnerships with universities in the US and local organizations abroad. Can you describe the expertise or professional backgrounds of those individuals and institutions and the nature of their collaboration with your organization? We don’t have anyone else who is full time. We worked with a lot of students and we do have board of directors. They are a working board, so they take the place of staff when it comes to doing HR and accounting and other administrative tasks. They’re important. They are a working board, not just fundraising and events. They write grants and provide scientific expertise. We have quite a few scientists on our board who help us with research. We’ve worked really closely with organizations in the country, so we end up working with researchers and students. We’ve also had students from the US and Australia come and do projects with us. I had a student from Australia with me this summer acting as a research assistant. Right now, we’re basically an all-volunteer organization. We’re hoping to get some bigger grants and get some local people. The plan for the organization was never to have a big North American staff, but the idea was to get the funding to hire veterinarians and researchers who are locals in Central America. We’re also applying for a grant to work on some research that I had done in Africa when I was a veterinary student. So, we might be expanding to another continent in the next year if we get that funding. With that, we would hire local research assistants to help with the project. We’re looking at the next 3 to 4 years being a big expanse of projects – hopefully, being able to do some of the on-the-ground veterinarian and public health work we want to do. We have a tick borne disease study that we’re working on which we want to expand and do a big tick borne disease ecology study because it’s an area that is understudied. There is only one research study out of Nicaragua that looked at banked blood samples from people with fevers, and they tested them for tick borne diseases. In the US, people get tested regularly for lyme disease and for rickett field diseases, but in Central America, most of the countries don’t test sick people for those diseases, so they’re completely under the radar and are probably causing some pretty significant burden of disease for which people aren’t being treated. We don’t know the extent of that, and with climate change, I’m interested in how climate change may affect the ecology of ticks and that will lead to how diseases are being transmitted. There really hasn’t been much work looking at tropical and new tropical tick ecology and disease transmission in the context of climate change. They are looking at that a lot in temperate areas. In the US and Europe, they’re very concerned about what climate change will do to ticks in those countries, and concerned it will unleash the burden of tick borne diseases – but they haven’t been looking at these tropical and new tropical countries where there’s a high level of ticks, and what’s going to happen when we have increased temperatures and abnormal rain patterns and big weather events like hurricanes. I’m interested in finding out how that might change things. Is that going to lead to more disease or less disease? What can we do to help the country recognize they need to be looking for, testing for, and providing capacity for this? That’s a really big project for us – we want to look at zoonotic diseases and land diseases, and terrestrial animals in addition to sea turtles. What is Cura Earth’s biggest challenge? Money. I realized after we started a nonprofit that the best way to start one is to be a millionaire or billionaire. When I looked at a lot of successful nonprofits, that’s how they got started. I don’t have access to big donors right now. We have been a volunteer organization since its founding. We’ve done crowd funding, small grants, and individual donations as well. We’re trying now to get bigger grants. We’re working on getting more of a donor base, which is challenging because a lot of people don’t understand our mission and they’re not familiar with the concept of One Health, or they don’t understand that these zoonotic diseases are being transmitted from animals to humans. It’s not an easy organization to explain to people, and to get them excited about, like fighting childhood cancer. There are only a handful of organizations that have a One Health mission, and those are 90 percent funded by grants and have a small donor base. We want to try to get more of a grassroots base, especially with providing veterinary care. Nicaragua, in particular, needs a sea turtle rehab facility, so we’re working on developing that. Those are things that are harder to get grants for. We really need to get donations to help us realize those ambitions of being able to provide veterinary care and rehab. Is veterinary care or research most important to the mission of your organization? They’re both important. We started out with a research intensive focus, partly because it’s easier to obtain money. Raising money for hands on the ground type of work – that can make a difference. Veterinary care is important because people are still living a subsistence lifestyle where they’re dependent on their livestock, and then we have public health concerns with cats and dogs in terms of rabies and other diseases. So, it can make a big difference in people’s lives to have good veterinary care, both from an economic standpoint and a public health standpoint. For me, it’s important that we start doing that. We’re really looking hard right now to find a source of funding for that. Global veterinary care is a big deal, even if you have your own animals versus a large population of stray animals. There are public health concerns from a number of different factors. Rabies is always a concern. Nicaragua has a low rabies burden, but they have had instances in the north of the country. Then, there’s diseases that aren’t zoonotic but can cause major mortality or disease in the cat and dog populations, which make them more vulnerable to spreading parasitic diseases, so when you have a sick animal whose immune system isn’t working well, they’re also more likely to get other diseases. There are a lot of parasites that domestic cats and dogs can pass to people – hookworms, roundworms, and giardia – there’s quite a long list. It’s actually very common, especially in third world countries, because of the way they live with their animals. They get a little more exposure. There’s the parasitic concern with rabies and diseases like Leptospirosis, which we believe dogs can transmit to humans. We have big concerns that when you have a large population of animals that are not getting proper veterinary care, or are over-populated, that they can cause disease in human populations. There’s always the problem that when you have unknown animals, you have to worry that they will bite, which could cause infections in the bite or tetanus or rabies. Dog rabies, less in Central America perhaps, is a big burden throughout the world. In India and in Africa, it kills thousands of people a year. What makes you hopeful for the world today? I’m hopeful because it seems like a lot of things are coming together well. We have a lot of people who are excited about what we’re doing. We are organizing with the vet school in León, Nicaragua, as well as with other organizations. We are going to be organizing a One Health conference there next year, in June. We are going to bring people in from vet schools, medical schools and public health, conservation biologists, and the government. We’re going to have workshops on what One Health means, and how do you can do that in research.We want to show people you can collaborate together – we can bring these disparate people who are in their own research silos and bring them together, to start making a difference by looking at things more holistically. I’m excited that the people in Nicaragua are excited about this because it could lead to some big changes in the country. We’re hoping it could lead to disease surveillance in wildlife, and bringing people together who are doing conservation biology – those who are in touch with the wildlife, and working with people who can monitor their health from a conservation standpoint and a public health standpoint. We’re hoping that we can build a group of people who are able to talk to each other and collaborate with each other. This has happened in other countries where they have been able to build a One Health working group. Our focus is trying to do that. It’s seems like we have some good opportunities for interesting research, and we’re also going to work with another organization in Nicaragua to start a citizen science program where we work with children, and do some DNA sequencing of the environment. Our goal is to make them more aware of what’s in their environment, and provide them some exposure to biotechnology. I think that’s going to be a really exciting program to inspire a generation of kids to look at their environment as a necessary good that needs to be protected. This will also get them interested in science as a potential career, or to just have a better understanding of science. We’re going to be working with a group that already has a junior ranger program with children where they do different environmental activities. For people who are reading this interview, we’re always looking for people who are interested in being on our board of directors or volunteering. I’m hoping that if they read the interview and are excited about what we’re doing, they’ll reach out. There is contact info on our website at https://www.curaearth.org/contact/. We’d love to hear from them. No Replies to "Addressing the Animal Origins of Infectious Diseases"